1. Remove the top of the wine holder, paint the top with the silver anniversary paint. Next, topcoat with three layers of silver extreme glitter. Once dry, hot glue trim around the top. Add feathers and flowers to the top with hot glue. 2. Next, trim the printed-paper to fit around the wine holder. Trim a strip of solid paper to fit down the wine holder. 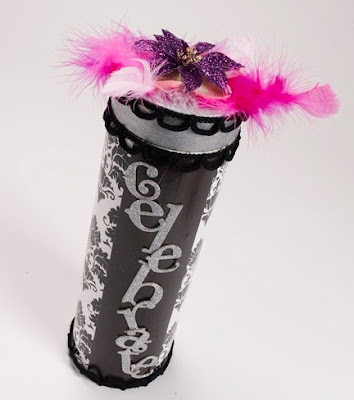 (you might need to piece the papers) Apply Mod Podge to the wine holder and the fronts and backs of the scrapbook papers. Wrap the printed-paper around the holder, press out air bubbles, smooth brush strokes on the top. Next add the solid strip of paper the same way. Allow to dry.